Really liked the game, I need to work on my logic skills though. I meant to play this sooner, but I really enjoyed it! Great mood and atmosphere and I liked the ending and story. Very well done. i really enjoyed this game! took about 20 minutes to play and it was tons of fun! i love it and i would love to see more! Awesome, what a beautiful little adventure. Really love this game! So far I really like the games coming from this developer! Keep up the awesome work! Would really love to see a full game of this! of fun do keep up the good work !! This was such a good game! I love all of the games that you make and I look forward to playing more of them! Good job! "The Librarian is a short point and click experience by Octavi Navarro beginning by means of ‘dark and story night’. As for what lurks in that night… it requires a bravery different than the kind needed to see through a whole cart of material being shelved properly." awesome!!! i LOVED Midnight Scenes i'm so excited to play this!! it looks so good~ ;w; congrats on the release and good luck and love for you and your next project!!! Thank you Erika for your kind words! I'm glad you liked it :) I hope you enjoy The Librarian as well! I only stumbled across this game now, surprisingly enough, and I really, really enjoyed playing it. The artstyle is amazing and the puzzles were really interesting. I can't wait to see your next project! 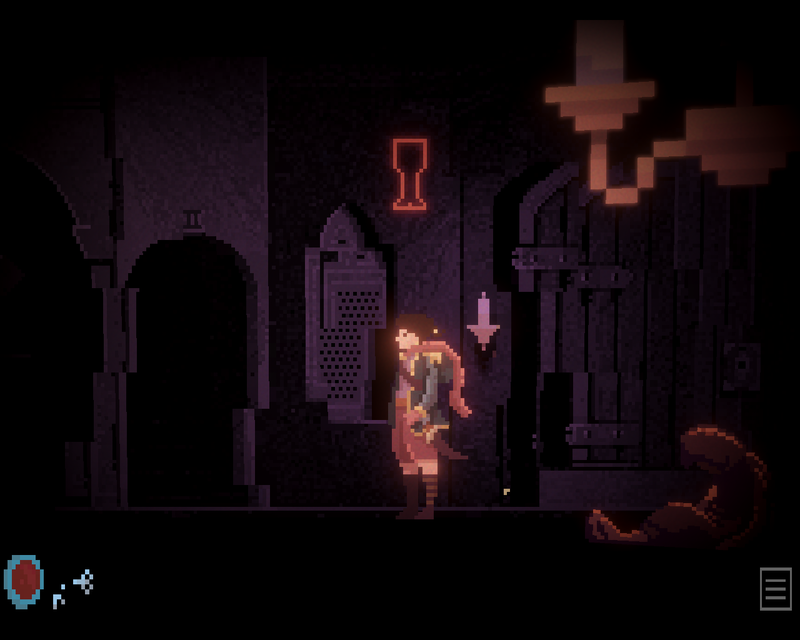 Love the pixelated artwork and the puzzles in this mysterious setting game. Some of the monsters like the the wolf that appear, its origins is post-apolitical almost? A very good game, with riddles very well conducted and an atmosphere who is doing well with the universe. In short, a good job ! Amazing game Octavi Navarro!! I really can't wait for your next title! Keep up the fantastic work! this looks beautiful! any chance there will be a Linux version? A really beautiful game. We enjoyed the pixel art style very much. Gameply, graphics, and sound were all very good. Could have used more of a story though, dont quite understand what the point of going to the library even was. Didnt feel like anything was achieved or accomplished. I'm not sure what I'm doing different than others. I have a knife & key, and entered the broken window to the library basement. Can't climb back out, and there's an empty spot on the bookcase that the character shrugs at. That's weird. Don't you have a book in the inventory? The one you get right at the start of the game? If not, it might be a bug and I would advise you to restart the game. Sorry for the inconvenience. Did this happen after loading a saved game? It was a lovely game indeed, the art is phenomenal and an interesting concept. I applaud you, Developer. This is game is stunning! It is beautiful in its pixel-styled graphics and makes you think when you solve the numerous puzzles it laid out for you. I would definitely play more of your games soon. Short and sweet! It'd be cool if there was a mini series or something of the sort! Love it! The Librarian is an atmospheric and very visually appealing adventure about figuring out what goes bump in the night. Crisp and moody audio works well to set the tone as events unfold, keeping the player wondering what could try to spook them next. And, of course, the art design is awesome, plopping you down in what looks almost like a haunted world, and giving hints of depth in some places, which I always love seeing in 2D style games. The puzzles are about what one would expect to see in a point'n'click game, with some requiring a little though, but none ever overstaying their welcome. Overall, this is a fine piece of work. Good job on this, dev. You make some nice pixels. Mommy, look! I managed to solve puzzles on my own without looking at a walkthrough! But honestly, I really enjoyed this game, even though it didn't scare me as much as I was expecting. Looks like I made the right choice following you. Octavi, you've struck gold again! This is a delightful little point and click game that leaves the door open for more stories in this universe, or if not it's a great stand-alone game! Played this game ! Found it so cool , like the good old games by lucas art I played when young. Suprisingly hard game when you're four pints in; Bonnie, Tim and I had a fun time playing this quite artistic game.